Shooting a commercial in New York, a motion picture in Hollywood or a documentary in Dallas, BarnDoor Lighting has the expert knowledge and gear for safely building your camera car mounts, lighting mounts and grip gear mounts. Building a car rig camera mount is easy when you have the proper tools. 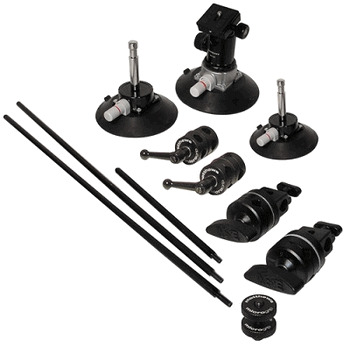 Suction Cup Camera Mounts are the simplest and easiest to use as the suction cup creates a vacuum on many non-porous surfaces like glass, steel, plastic and sheet metal. For the most secure mount remember to triangulate -- attach at 3 points creating a triangle mount. Mount your camera on one suction cup and then support it with rods, clamps and grip heads to 2 additional suction cup mount points.